Egyptian authorities have finally recaptured a town in central Egypt that had been under the control of hardline supporters of ex-president Mohamed Morsi for more than two months, locals have told the Guardian. Armed crowds in Delga, a remote town of 120,000 people in Egypt's Minya province, first scared away its meagre police force following Morsi's overthrow on 3 July. They then unleashed a campaign of terror on the town's Coptic Christian minority, who make up around a sixth of the local population. Two earlier attempts to retake Delga failed, but in the early hours of Monday morning police launched a third and decisive assault, and have now re-entered the town, residents said by telephone. Further assaults on up to 10 other towns in the region where Islamists have also weakened state control since July are also planned, Minya's governor, Salah Zeyada, said. The move on Delga may have come too late for much of the town's Christian community. Up to 100 Christian families have fled since July, with dozens of Coptic properties – including three of Delga's five churches – torched and looted. Some Muslims stood by their Christian neighbours, but many Coptics were forced to pay protection money, and were unwilling to roam the streets freely in case they were attacked. "Nothing can stop anyone in Delga. It's a free-for-all," one local Christian activist, who asked not to be named for fear of reprisals, said before police re-entered the town. "Copts tend to stay in their homes without work and our lives are unbearable." The violence peaked on 14 August, the day soldiers and police slaughtered hundreds of pro-Morsi supporters at two protest camps in Cairo, where about 350 Muslims from Delga were among the thousands demonstrating. In retaliation, groups of armed men across the country attacked dozens of police stations and at least 42 churches. Egypt's Coptic Christians, who form about 10% of the country's 85 million population, have long been targets of sectarian attacks, said Minya's bishop, Anba Macarius. But the hatred heightened this summer after Copts were blamed for Morsi's overthrow by some of his backers – even though his removal had strong support from Muslims and Christians alike. During August's anti-Christian backlash, Minya province, 150 miles south of Cairo, was the worst affected. "As soon as the crackdown in Cairo started, all the loudspeakers at the main mosques in Delga issued calls for jihad," said Samir Lamei Sakr, a prominent Christian lawyer who fled from the town later that day. "One of them was as follows: 'Your brethren are being killed at Nahda and Rabaa [the two Cairo camps]. Everyone with a weapon, come out to save them from their killers – the Christian infidels, the police, and the army.' It was a call made across the village." According to Christians in Delga, huge mobs carrying machetes and firearms then attacked dozens of Coptic properties, including the 1,600-year-old monastery of the Virgin Mary and St Abraam. "Everything was looted," said a Delgan church worker who asked not to be named. "Even the electric wiring was ripped out. The pews were taken and the place was burned afterwards. Twenty icons were burned or stolen … The gates were also stolen so the place was open for 10 days and people could just barge in when they felt like it. So some idiots showed up and started to dig in the garden hoping to find treasure." Nearby, Sakr's home was among 60 Copt-owned properties targeted by the mobs. Escaping with his wife, two children and his mother, Sakr was hit by 13 shotgun pellets, while his mother survived a pellet that hit her below the eye. Sakr's cousin, Iskandar, who owned a barber shop, was not so fortunate. According to Sakr, a mob "broke through his shop, and beat and killed him inside his home. There is a video [seen by the Guardian] showing him being dragged from the first floor. His body was then attached to a tractor and driven around town. Some of his Muslim friends got hold of his body and buried it right away – but the attackers unearthed him again and kept dragging him around town." In Delga, as across much of Egypt, state officials have been criticised for failing to protect Christians. "On 14 August, when we were calling for help, no one answered. Not the police, not the army, not the fire service," said Bishop Macarius, sitting in a Christian compound in Minya this week. Nearby churches – within sight of the provincial police headquarters – still bore the marks of arson. On one of the compound walls, a sectarian slogan attacked Tawadros II, the Coptic pope: "Tawadros is a dog." The police said that on 14 August they had their hands full dealing with attacks on police property. "There are many reasons why there was not 100% protection for the Copts on the 14th," said General Osama Metwaly, the province's new police chief, appointed last week. "One reason is that the police were under attack themselves. Another is that the churches were in very densely populated areas and the police did not want to go in and create more damage." The situation has raised concerns that Egypt's government – already fighting Islamist militants in the eastern Sinai peninsular – could eventually face a smaller insurgency in central and southern Egypt. The areas were already known as strongholds for Islamist terrorists during the 1990s, and officials say there was a surge in smuggled weapons during Morsi's lax year in office. For their part, local Islamists deny responsibility for the sectarian attacks, claiming they were the work of criminals who used peaceful pro-Morsi protests as a smokescreen for vandalism. Officials and activists blame members of Morsi's Muslim Brotherhood and their hardline offshoot Gamaa Islamiya for inciting the violence – claims rejected by their representatives. Ali Delgawy, a Delgan member of Gamaa Islamiya's political wing, claimed his group "has a history of resolving conflicts between thugs and Copts, and of restoring property of Copts". .
"A minority of the Christians blew matters out of proportion, going on the internet to denounce their Islamist brethren," added Mohamed el-Awamy, a former member of the regional parliament from Delga. 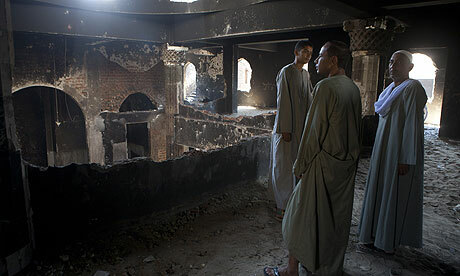 "In fact, the Islamists told the thugs to stop attacking churches, saying it was forbidden." El-Awamy's argument was undermined by comments made by a Minya-based imam, who twice told the Guardian at a pro-Morsi protest in July that Morsi's downfall would prove "very bad in particular for the church in Upper Egypt, because everyone knows they have spearheaded this campaign against the Islamic project". Ahmed Salah, a local human rights lawyer whose clients include Islamists, argued that Islamist groups carried the "moral blame" for creating an environment in which sectarianism was so rampant. But he expressed caution about the imminent police crackdown in Minya province, arguing that officers were unlikely to have properly investigated who was involved, and risked arresting the wrong people. "They have a retaliatory doctrine," Salah argued of the police, whose brutality was a major cause of Egypt's 2011 uprising, but who have become more popular after backing Morsi's overthrow. "Their doctrine is not to protect the people but to take revenge on those who attacked them and stole their weapons." Minya's governor Zeyada, a former police general, said that the police crackdown in Delga and other areas "will only arrest criminal elements without harming peaceful elements". But for Delga's 20,000 Christians, facing their twelfth consecutive week of sectarian oppression, such arguments were academic. "We want security to return to Delga so that we feel that we are people of value," said the church worker. "Right now we feel we are worthless." For many of his neighbours, any intervention is too late. "I have nothing," said Sakr, now staying with relatives in Cairo, "to go back to".